Big-city kids don't have to worry so much, because they can always arrive by bus. But in suburbs and small towns, one of the most excruciating agonies of adolescence is the experience of being dropped off by your parents at a party, especially while your friends are watching. Parents are an embarrassment when you are 15, because they offer documentary proof that you don't have your driver's license. "License to Drive" remembers feelings like that, and it brings back the whole complex of emotions about being 16 and taking your test (nobody ever had to ask, "Which test?") and getting your license. It begins with daydreams of red Corvettes and then cuts to one of those cautionary driver's ed films in which "as little as a quarter of an inch of water" can cause the dreaded phenomenon of hydroplaning, as a car spins wildly out of control, its hapless occupants trapped inside. My driver's education teacher in high school was Oscar Adams, who survived thousands of harrowing rides with teenagers who hit the accelerator and not the brake at the approach of a cement truck. He taught us how to back up, do turnabouts, parallel park, stick-shift and perform all the other maneuvers that meant we were ready to be trusted behind the wheel. To this day, I cringe when friends commit feckless U-turns in the middle of intersections, breezily assuring me that everyone does it. Nobody taught by Oscar Adams would ever commit such a crime, and thousands now dead in traffic accidents would still be grilling their weenies on the backyard grill if Oscar Adams had taught everyone how to drive. The first half of "License to Drive," which is mostly concerned with taking the lessons and passing the test and getting the license, is very funny. The second half, which is mostly an extended chase scene in which a hapless teenager's grandfather's Cadillac is wrecked by a drunk, is much more predictable. I would like to state as a general theory the notion that physical humor involving automobiles has more or less been exhausted for our lifetimes. 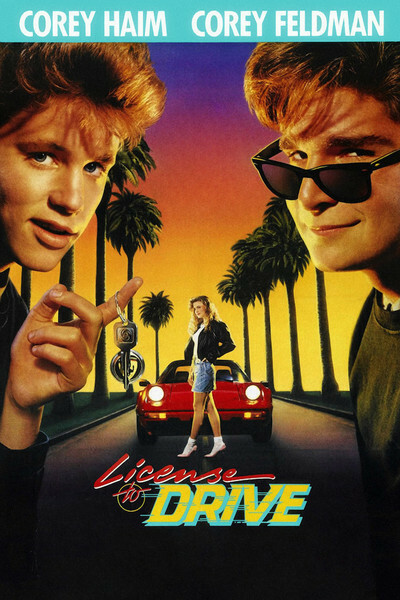 But "License to Drive" is a more-than-passable summer entertainment, especially when it identifies with the yearnings of its young heroes to get behind the wheel. The film stars Corey Haim, last seen in the wonderful "Lucas," as a kid whose twin sister passes the test with a perfect score, while he agonizes over multiple-choice questions. (OK, what would YOU do if you encountered a large pool of water? Step on the brakes? Gently accelerate? Hydroplane?) Meanwhile, the most beautiful girl in the school, named Mercedes (Heather Graham), asks him out for Saturday night. What to do, since he doesn't have a license? He borrows his grandfather's Caddy, an immaculate '72 boat the length of a tennis court, and crosses his fingers. The movie's funniest moments are provided by James Avery, as a gruff driving instructor who balances a cup of coffee on the dashboard and tells Haim it had better not spill, and Helen Hanft, as the woman in charge of the license examinations. The scene where Haim takes his driving examination neatly recaptures the sheer terror of the experience through dozens of little details, minutely observed. There are also some nice moments with Haim's parents (Richard Masur and Carol Kane), who try to juggle his passions about driving with the fact that Mom is very pregnant. Up until about the halfway mark of this movie, I was having a very good time. Then, somehow, it ran out of energy. The extended chase sequences, in which the precious old Cadillac is systematically destroyed, were versions of scenes I've seen countless times before. The stunts - including a car that races backward and hurdles through the air - are no more funny, or interesting, in "License to Drive" than in any of the other would-be comedies about the mistreatment of automobiles. Somehow, Hollywood must have it fixed in its mind that a comedy must end with a chase scene. Since chases are so rarely really funny, however, all they do is replace the freshness of invention with the predictability of arranged stunts.